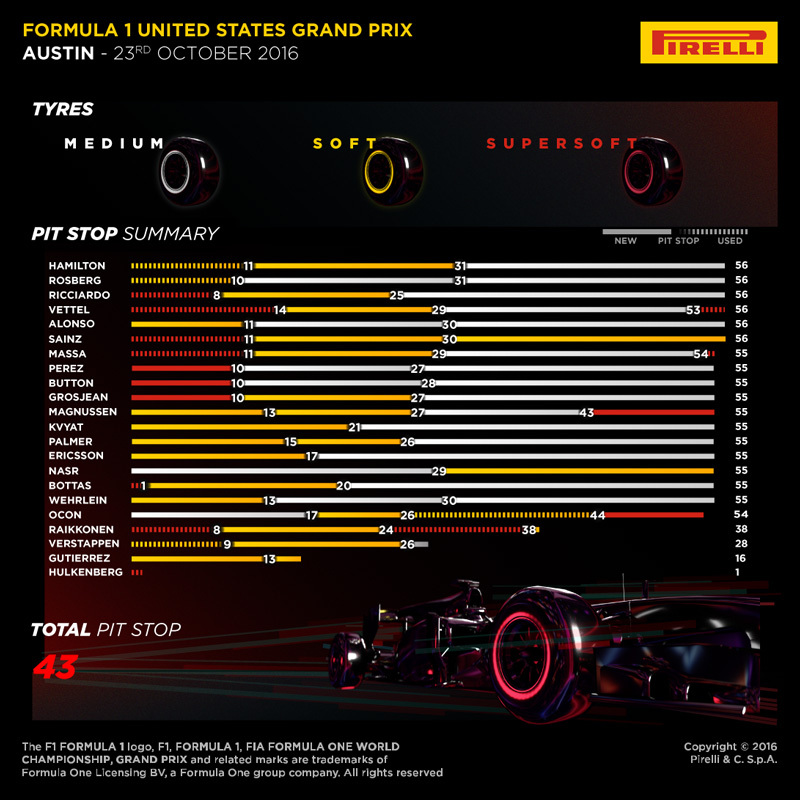 USA GP F1 Strategy Report Podcast – our host Michael Lamonato is joined by Trent Price – F1 journalist. 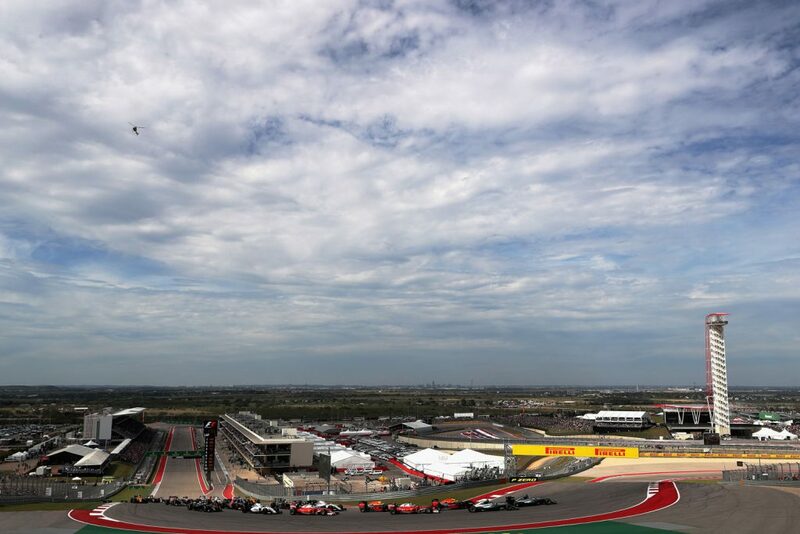 The Circuit of the Americas once again hosted a fun-filled United States Grand Prix, with Lewis Hamilton going on to claim his fourth victory at the track and fifth in the country. The British driver has now cut his team-mate Nico Rosberg’s lead in the championship down to 26 points with three rounds remaining. Rosberg finished in second place, with Daniel Ricciardo third for Red Bull. We’ve seen it many times before during the 2016 season, but Ferrari seems to like making strange and unusual strategy decisions during races. The team’s drivers looked to be on alternative strategies, but only one car made it to the chequered flag. Kimi Raikkonen started the race strongly on the super-soft tyre, getting the jump on Max Verstappen and running up in fourth place. He pitted on lap eight to ditch the softest tyre compound, opting for the yellow-marked softs for his second stint. He fell behind Verstappen and then gradually started to drop off the back of the Red Bulls, into the clutches of his team-mate Sebastian Vettel. Unusually on lap 24 Ferrari pitted him for another set of super-softs, which released Vettel. Were they trying to get Raikkonen out of the way? After a decent 14-lap stint they pitted him again but there were concerns a wheel nut wasn’t on properly and he stopped just after the pit exit, before bizarrely rolling down the hill, into the pitlane and retiring. Meanwhile Vettel did a super-soft stint to begin with, before a soft-tyre stint and a fairly short (in comparison to other drivers) section of the race on the mediums. Weirdly, Ferrari pitted him for super-softs with three laps to go. Maybe it was a precaution or he was really struggling with tyres but he didn’t have anyone around him to challenge his fourth place, with Raikkonen and Verstappen failing to finish. So he ended up a distant fourth. Red Bull looked like a decent match for Mercedes, or at least Rosberg. Ricciardo held onto second place early on before his stop to go from super-softs to softs on lap eight, quite early and an aggressive move. He pitted for a second time on lap 25. But the Virtual Safety Car emerged a few laps later, ironically to clear his team-mate’s stranded car. Mercedes pitted both drivers to go to the end but as Red Bull had just stopped Ricciardo, they decided not to. It proved costly, as Mercedes basically got two free pitstops – one for each driver. That cemented Rosberg in second place and Hamilton in the lead. It’s possible Ricciardo could’ve challenged if Red Bull had pitted him under VSC as no time would’ve been lost and he would’ve been on equal tyres with the same amount of laps on them. As it is, he went all the way to the end on the mediums he changed to on lap 25 – an impressive stint, but one that saw him lose some ground late on to finish a slightly lonely third. The VSC and various other reasons, including the first lap contact and a few incidents and punctures, meant we saw a range of two and three-stop strategies during the race. The three compounds (super-soft, soft and mediums) worked well and proved to open up just the right amount of strategy, without making it chaotic. The top three all pitted just twice, with Red Bull going on a long final stint with Ricciardo and the two Mercedes drivers starting on the softs and going to laps 10 and 11 respectively for Rosberg and Hamilton. The team put Rosberg on the medium and Hamilton on the soft tyre, but the VSC opened up a chance to stop both and neutralise any shot of seeing how the two different strategies would’ve played out. All three compounds got a heavy amount of use, the super-soft was probably the most unpopular tyre because the soft and mediums worked so well in the relatively warm conditions – they were able to hold up for a long period of time, while generating good performance. A few drivers did go for a one-stop though, with Daniil Kvyat, Marcus Ericsson and Felipe Nasr all doing so. 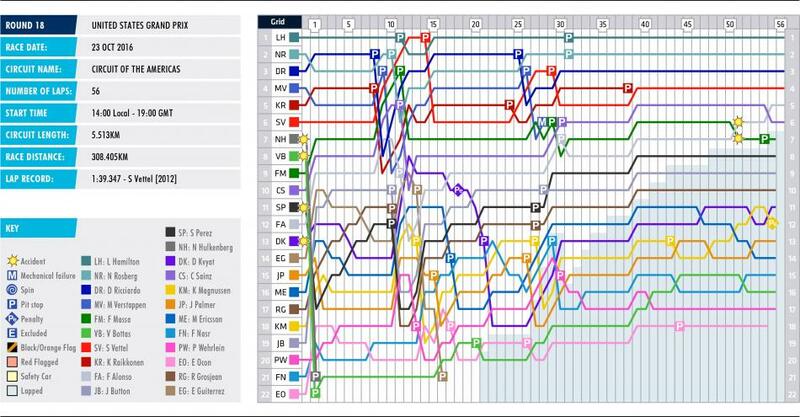 It didn’t quite pay off but it was worth the risk, especially for the so far point-less Sauber. The rule of the drivers starting on the tyre they set their fastest time on in Q2 shook up the grid once again, with a few drivers at the front of the field (Hamilton, Rosberg and Verstappen) making it through to Q3 on the softs. The rest started on the super-softs, which gave them a small performance advantage at the start, while a range of other strategies were used – some lower down the field chose the softs to start and a few even went for mediums. 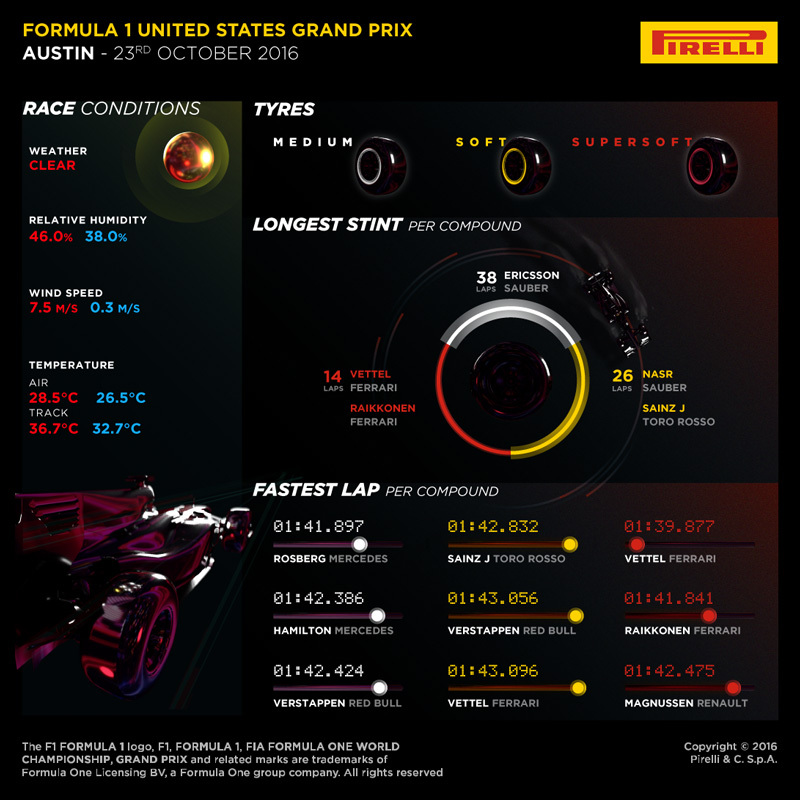 Tyre performance gaps seemed fairly small in Austin though and that meant going for a different compound at the start didn’t cost drivers a huge amount of time, although those on the mediums did struggle initially. Super-softs helped Ricciardo and Raikkonen make up a place each but the early stops cost them a little time.